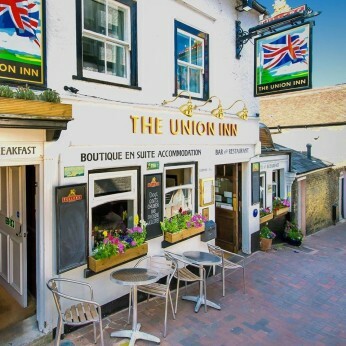 The family run Union Inn is situated in the famous yachting town of Cowes just 100 yards from the sea front. Over the years we have built up a reputation for quality home cooked meals, locally produced beers and a selection of wines and other beverages. The Union Inn offers 6 newly refurbished, individually themed, en-suite letting rooms all designed and furnished in a boutique style. A haven for yachting enthusiasts, business people and holiday makers and an ideal all-year-round base from which to explore the Isle of Wight. Ideally located in Cowes Old Town it is close to all the Yacht Clubs and in easy walking distance of the Marina. Now re-open after a month long refurbishment the owner and staff are ready to welcome you to the cosy fireside inn.